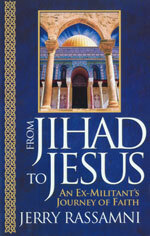 You may order a copy of From Jihad To Jesus by clicking on book image below. Thank you for taking a few moments and stopping by. This site is intended to provide you with information regarding the book "From Jihad to Jesus" as well as its’ author Jerry Rassamni. After escaping Lebanon, Rassamni eventually made his way into the United States long before 9/11. The love of Christians gradually melted his hardened heart. Having seen the darkness in his own heart, he began to question his inherited beliefs but found it difficult to consider Christianity. “I thought, ‘me become a Christian? You must be kidding me! Christians ministered to me with their bullets in Lebanon. Furthermore, Christ was a Jew.” His hesitation soon gave way as “I read about a God who loved me so much that He paid the price for my sins, so that I could come before the throne of the Creator of the universe, and call Him Baba” – affectionate word for father in Arabic. Jerry continues: “This revelation rocked my world.” Rassamni soon recognized that hatred is not an attribute of the Almighty but that God is love. Rassamni says, “Cold blooded murder is evil. Love is superior to hatred. Freedom is more precious than suppression. Truth is nobler than plagiarism.” He explains that Islam mercilessly crushes dissent. If you have personal questions or are struggling with "hard issues" of faith, please visit Jerry's blog were you can ask him questions directly as well as research some of the many questions already posed. Also, please make sure you visit the Resources page for some interesting insights. You will find a man with a true heart for telling others about the awesome power of God's perfect love in an unapologetic way!